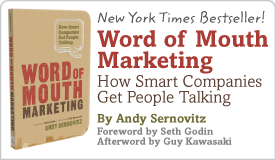 Simplest way to get people to buy from you | Andy Sernovitz | Damn, I Wish I'd Thought of That! ← Why did the white can freak everyone out? If your product isn’t all that different, how can you get people to buy from you? Look for the simplest possible improvement in the experience, not the product. Example: I buy Del Monte beans because I don’t need to mess with a can opener. It only takes one great feature to put you in the lead. Find it or add it.